Time to Replace Your Wellcraft Boat Canvas? Wellcraft has a legacy of building iconic boats that have satisfied the most demanding boaters for generations. That same passion for design and engineering leadership is what lead Wellcraft to choose Ameritex as their canvas provider for nearly two decades. You own a Wellcraft boat because you demand the best. 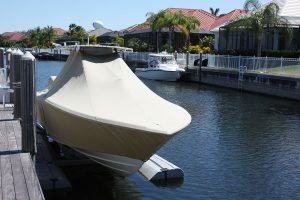 And when your boat needs new canvas after years out on the water and day after day in the hot sun, you want to replace your worn out cover, top or enclosure with the best. Ameritex is the company that made the canvas for your Wellcraft when it left the boatyard for your dock. And weâ€™re the people that can make it again for you now. Custom-sewn from the original patterns. We worked closely with the engineers at Wellcraft to develop the best fitting, best performing marine grade canvas for your boat. We will remake those exact same canvas parts at our state-of-the-art facility, and deliver them to you, factory-direct and ready for installation. Wellcraft is known for fishing boats designed by fisherman for fishing. Ameritex is known protecting your investment and the boat you love so much. Find out just how easy it is to restore the worn out canvas on your Wellcraft to brand new by submitting a no-obligation quote request now.